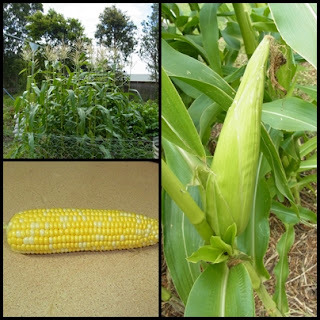 miss~nances life: How does your garden grow. 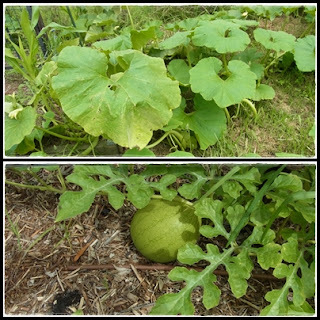 We are on the last of our summer gardening and the garden is looking a little raggy but we are still harvesting most days - tomatoes, corn, zucchini, leaf beets, carrots, parsnips, kohlrabi and lots of herbs. We have had a big battle with weeds behind the garden bed as Royce removed the natural mulch from under the trees and the weeds just took over. we are on our way to get them under control,hoping in the next few weeks to put up a fence from the chicken paddock to the vegies patch to let the girls in to do their thing while we rest the garden over winter. Royce has been offered a garden patch on the wine estate that he is now working at (in cellar door as well as restaurant) for his vegie garden as he hopes to supply vegies for the restaurant. 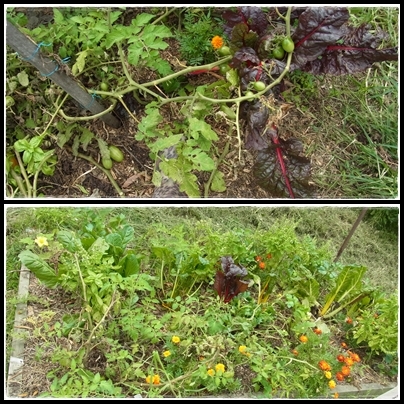 Our garden has never really been rested in the three years we have had it. A general over view of two of the beds. Our tomatoes took of quite late this year and we are still harvest a container ever few days. We had great success wiht our corn patch this year, next year we will do several planting to make the season last a little longer. I picked the last of the corn yesterday but unfortunately a bug got into them... but we had almost a month of picking several ears each day. We planted our pumpkins and melons a little late this year so we are not sure if we will get any fruit as the days get shorter and cooler. 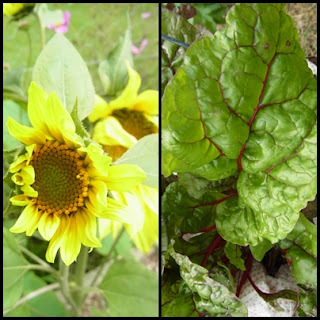 A close up using the macro on my new camera (which I unfortunately left behind on the weekend and am praying desperately that it turns up) of a sun flower and red leaf beet (as silverbeet). Thank you for joining me in my tour of the March garden....... please don't forget to leave me a message, I read everyone of them.